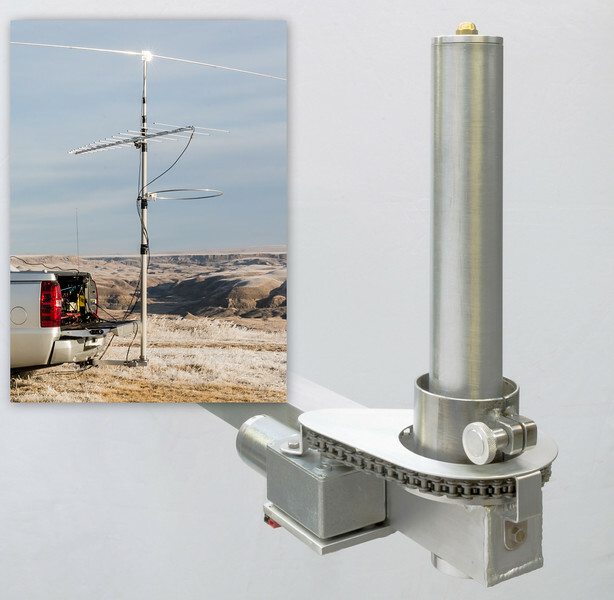 Several years back, I acquired a Max-Gain Systems push-up mast that was to be used with my truck while operating stationary mobile. To mount the mast on my truck, I built a hitch-insert of aluminum tubing as seen in the insert photo. It was as simple as inserting the hitch-insert into the receiver on my truck, locking it in place, and dropping the mast in place. At that point I built a 1/2 wave inverted U dipole that covered the bands of 10-20 meters, and this antenna with its mount was custom fabricated to fit at the top of the 28' mast assembly. Well it worked out perfectly, and over the next year I was more than happy with this arrangement. Now this antenna needs to be steered in the direction that the station that I am working is located. To do this, all I had to do was manually turn the mast to orient the antenna in the desired direction as required, no big deal. Some time later, I built a 6 meter DXing Halo, and followed that antenna up with my latest creation, a log-periodic covering the bands of 2 meters, 1 1/4 meters, and 3/4 meters. I constructed mounts allowing these antennas to also be mounted on my push-up mast as well. Now although the mast assembly was not that difficult to turn with the added weight, I found that I was getting out of my truck where my radio stack is located, or from a operating position outside of my truck, and re-positioning the antennas more frequently due to the fact I was now working more bands. So recently, I found myself thinking about how I could add a motorized rotator to the Max Gain Systems mast assembly. Once I had it worked out in my head, and after checking out what was available for the parts required to make it happen, I got to work in my shop. With several visits to my local sprocket supply outlet to check out what was available for sprockets, and for what size chain, and with time spent on the computer sourcing out 12 volt reversing motor driven worm-drive assemblies, I had a design worked out that I could build. So with a day spent in my shop, this is where I'm at with the antenna hitch insert taking on a new look as seen here, as well as on my mobile in the insert photo. Located just above the 2" square insert tube is the aluminum thrust-bearing support that is built from 6061 T6 high-tensile aluminum. Just above this aluminum support is a 4" OD needle thrust bearing with hardened races. The 12 volt motor with the included gearhead is mounted on the side of the main hitch-insert tube with a custom aluminum bracket tig-welded in place to the tube. The placement of the bracket was dictated by the alignment of the two sprockets sized for 35W roller chain. The ratio and speed of the 12 volt motor/gearhead assembly selected, along with the chosen gearing for the sprockets allow the rotor/mast assembly to do a full 360 degree rotation in less than a 1 minute, allowing for good control of where the antennas are required to be positioned when operating stationary mobile. The mechanism at the base of the mast is a lock allowing the mast and the drive-sprocket to lock together. The mast has a stainless steel ring installed surrounding the bottom end of the fiberglass mast protecting the fiberglass tube, and secondly allowing the lock/mech seen here to clamp to this SS ring when the knob as shown is tightened, therefore providing a positive drive to the mast assembly by the rotator. This also allows for manually turning the mast if required, by dis-engaging the lock/mech. You may be wondering as too how the hitch insert as shown here is held together, in regards to the joining of the 2" square horizontal tube with the 2" round vertical tube. The two aluminum tubes were joined together through tig-welding, and the aluminum plate machined to hold the 4" OD thrust bearing will also be tig-welded in place as well, adding to the rigidity of the complete assembly. Although the welded joints are able to withstand the load they will be subjected to with the mast in place, I also took into consideration the lateral loading that the assembly could be subjected to if the wind is blowing against the mast when extended with all the antennas in place, and no guy-lines for support. For added rigidity, I machined two 6061-T6 aluminum discs, one positioned (partial insert) at the very top of the vertical tube, and at the other positioned below the 2" square tube. They are tensioned with a 18" length of 3/8" OD hi-tensile drill-rod joining the two circular discs, that adds extra support to the vertical 2" tube for potential extra side loading conditions, taking some of the load off of the welds at the bottom of the vertical tube, and distributing the lateral load more evenly along the length of the vertical tube with the fiberglass mast in place. Not displayed in this photo is the 18" length of fiberglass tube that is positioned between the aluminum vertical tube as shown, and the inner wall of the mast assembly when in place. This insert tube besides giving support to the mast, is free-floating and designed to turn, acting as a thrust bearing for the lateral loads present when the mast is being turned with the rotator. Controlling the rotator is with a two-button key-fob transmitter, controlling a reversing polarity 12 volt motor control unit mounted in the cargo-bay, and when operating stationary mobile, a two conductor cable is temporarily connected to the rotator allowing for the rotator to become operational.